The Lord said to the Jews who came to him: "I can do nothing on my own authority; as I hear, I judge; and my judgment is just, because I seek not my own will but the will of the Father who sent me. If I bear witness to myself, my testimony is not true; there is another who bears witness to me, and I know that the testimony which he bears to me is true. You sent to John, and he has borne witness to the truth. Not that the testimony which I receive is from man; but I say this that you may be saved. He was a burning and shining lamp, and you were willing to rejoice for a while in his light. But the testimony which I have is greater than that of John; for the works which the Father has granted me to accomplish, these very works which I am doing, bear me witness that the Father has sent me. 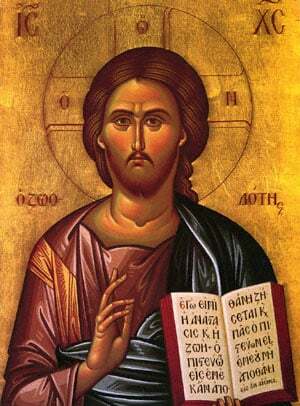 And the Father who sent me has himself borne witness to me. His voice you have never heard, his form you have never seen; and you do not have his word abiding in you, for you do not believe him whom he has sent. You search the scriptures, because you think that in them you have eternal life; and it is they that bear witness to me; yet you refuse to come to me that you may have life. I do not receive glory from men. But I know that you have not the love of God within you. I have come in my Father's name, and you do not receive me; if another comes in his own name, him you will receive. How can you believe, who receive glory from one another and do not seek the glory that comes from the only God? Do not think that I shall accuse you to the Father; it is Moses who accuses you, on whom you set your hope. If you believed Moses, you would believe me, for he wrote of me. But if you do not believe his writings, how will you believe my words?" After this Jesus went to the other side of the Sea of Galilee, which is the Sea of Tiberias. And a multitude followed him, because they saw the signs which he did on those who were diseased.